Below you will find Solar Decathlon news from the Las Vegas archive, sorted by date. DENVER, CO – Acting Assistant Secretary for Energy Efficiency and Renewable Energy Daniel Simmons today announced the winning team of the U.S. Department of Energy (DOE) Solar Decathlon 2017 in Denver, Colorado. 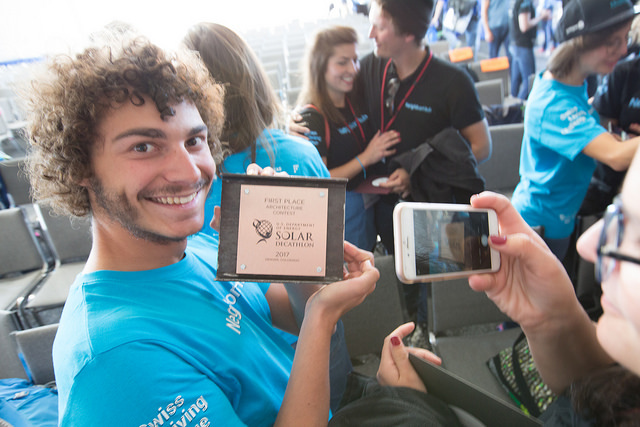 The Swiss Team took first place overall by designing, building, and operating the house that best blended smart energy production with innovation, market potential, and energy and water efficiency. The University of Maryland took second place followed by the University of California, Berkeley and University of Denver team in third place. The whole University of Nevada, Las Vegas team choked up when their 1st place finish for the Innovation Contest was announced. Adam Betemedhin, who accepted the award, indicated “we’re really happy to be here.” Insert happy tears emoji! Solar Decathlon Open to the Public Today through Sunday, October 15, from 11 a.m. to 7 p.m.
DENVER, CO – Before a crowd of student competitors near the 61st and Peña Station in Denver, Colorado, the University of Nevada, Las Vegas took first place in the Innovation Contest, and Northwestern University won the Communications Contest of the U.S. Department of Energy (DOE) Solar Decathlon 2017. For the Innovation Contest, the collegiate competitors were judged on how well they demonstrated a thoughtful approach to innovation, rather than being limited solely to off-the-shelf solutions, in the design and construction of houses that integrate renewable energy systems and energy-efficient technologies. The Communications Contest rated each team’s effectiveness in communicating the features of their house and their experiences during this project to jurors and the public through a variety of media including websites, audiovisual presentations, displays and tours. For the first time in Solar Decathlon history, teams are taking home prize money. First place in the overall competition (to be announced tomorrow) will win $300,000, second place wins $225,000, third place wins $150,000, fourth place wins $125,000, and fifth through eleventh place will win $100,000 each. Swiss Sweep Architecture and Water Contests! The Swiss Team cleaned up today as they took first place in both the Architecture and Water Contests with their NeighborHub competition house. DENVER, CO – Before an enthusiastic crowd near the 61st and Peña Station in Denver, Colorado, the Swiss team took first place with a perfect score of 100 points in the highly competitive Architecture Contest, and also clinched top honors in the Water Contest at the U.S. Department of Energy (DOE) Solar Decathlon 2017. For the Architecture Contest, the students were judged on the design and construction of attractive, high-performance houses that integrate renewable energy systems and energy-saving technologies. In the new Water Contest, teams were evaluated on how well their houses conserve water, enable reclamation and reuse, and integrate low-water landscaping. The 10 contests that make up the Solar Decathlon encourage teams to design and build comfortable, solar-powered, innovative houses that combine highly energy- and water-efficient construction designs, appliances and renewable energy systems. Albert Einstein once said, “That is the way to learn the most, that when you are doing something with such enjoyment that you don’t notice that the time passes.” This advice to his son, encouraging him to practice piano and carpentry, still holds true 102 years later. I’ve certainly found myself surprised by the clock after teaching an anatomy lesson at Iowa City Regina or during a football practice with my fellow Denver Broncos. I agree with Einstein—passion is the key. Is That the Sun I See!?! Yes! One week from today, the U.S. Department of Energy Solar Decathlon 2017 officially opens to the public and the teams start earning points! In addition to forecasted sunnier weather, we’re looking forward to seeing all the smiling sunny faces of the people who come to our Opening Ceremony next Thursday, October 5, starting at 9:30 a.m. Be sure to check out our Visit information so you can join us at the 61st and Peña Station on the University of Colorado A line commuter rail, just one stop from Denver International Airport. Editor’s Note: This entry has been cross-posted from EERE’s Energy blog. One month from now, a solar-powered village will suddenly appear in Denver, Colorado, showcasing the latest innovation in building science and design. From modular construction to water conservation and re-use strategies, this year’s crop of Solar Decathlon houses has it all when it comes to technology, design and creativity. On Aug. 28, U.S. Senate Majority Leader Harry Reid visited DesertSol—the University of Nevada Las Vegas (UNLV) house that won second place overall in the U.S. Department of Energy Solar Decathlon 2013. Now located permanently at the Springs Preserve in central Las Vegas, Nevada, DesertSol has been one of the Preserve’s most popular attractions since it opened to the public in March 2014. A house is just a building until people live in it. Then it becomes a home. 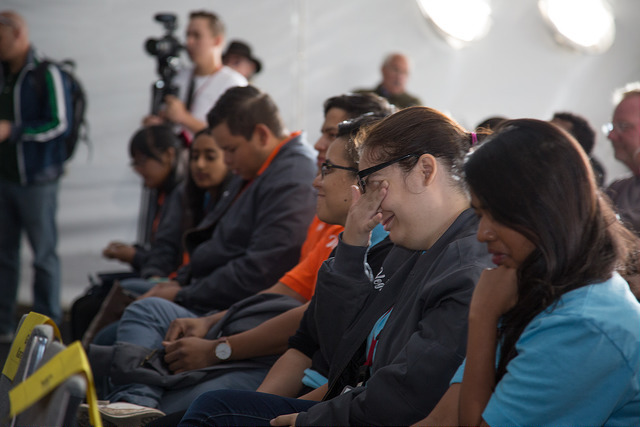 Although U.S. Department of Energy Solar Decathlon houses are not lived in during competition, Solar Decathlon visitors may ask themselves whether they could be comfortable homes when stepping through their thresholds. Vienna University of Technology Wins Solar Decathlon 2013! Team Austria from the Vienna University of Technology has won the U.S. Department of Energy Solar Decathlon 2013. Czech Technical University took first place in the highly competitive Architecture Contest and Vienna University of Technology received top honors in the Communications Contest this morning at the U.S. Department of Energy Solar Decathlon 2013.